· After a strong starting rally of 100% in a year QMS went through a year of consolidation, falling 30% as it formed a base near $1 before breaking upwards again just a month ago. · Performance has been strong since listing and saw earnings growth of nearly 40% last year with similar predictions coming for the year ahead, backed by strong expectations for further growth across sales, margins and earnings. 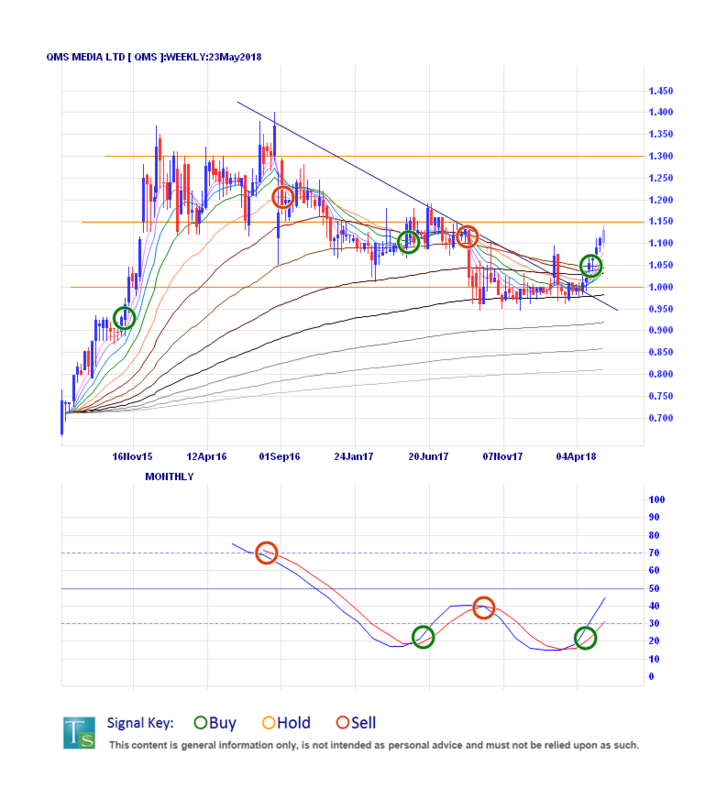 · Pricing has good signal correlation and with the breaking of linear resistance in April and additional signs of strength we see a new uptrend emerging here. · Resistance targets at $1.15, $1.30 and $1.40 loom ahead and we see good support layered down from $1.10, $1.00 and $0.95 if needed. We have recently been finding a number of companies in the advertising and marketing rising to the top of our selection criteria, and that should be a good thing as it shows good strength across the sector. Whatever they are selling it has us wanting more as we look at QMS Media Ltd (QMS) as the marketing company looks set to pitch higher. Listing on to the ASX in 2015, this outdoor advertising specialist operates static and digital billboards as well as retail, transit and street advertising throughout Australia and New Zealand. Already the market leader in New Zealand, QMS has the largest ‘on-field’ media network in Australia with stadium advertising across AFL, NRL, cricket, rugby, netball and soccer. Following strong growth in its digital strategy there is a continued digital billboard roll out, and plenty of growth potential remains through organic or acquisitive growth with the added interest of takeover potential adding some shine. Not that it needs much polish as performance has been strong with earnings growth of nearly 40% last year and forecasts call for a similar result this year. Yield is still low but should climb above 2% next year and until then this remains a great growth prospect and is undervalued by around 16% against the aggregate analyst valuation. Forecasts show expectations for increasing sales, margins and earnings, with lower debt, continuing out to 2020 and this is well reflected with the covering analysts being all positive with no negative or neutral views. Pricing shows QMS doubling from the $0.65 lows of the mid-2015 listing to peak at $1.40 a year later. Since then we have seen a near-textbook-quality distribution pattern develop into a 21-month falling consolidation taking pricing lower by 32% until last month when linear resistance broke on positive long-term signalling. Immediately overhead we have $1.15-$1.20 resistance after bouncing off base support layered between $0.95 and $1.00. There could easily be an opportunistic buying entry closer to $1.05 if overhead resistance holds in the short-term, but with the emerging long-term uptrend we would be looking to buy dips with an eye on the bigger prize. QMS Media presents an eye-catching combination of very strong historical performance and excellent forecasts, whilst also showing good technical signalling and positive momentum building in the long-term timeframe. There should be some volatility as price works through $1.15-$1.20, but we would be looking for beneficial entries and think it should continue to pay to advertise with QMS.